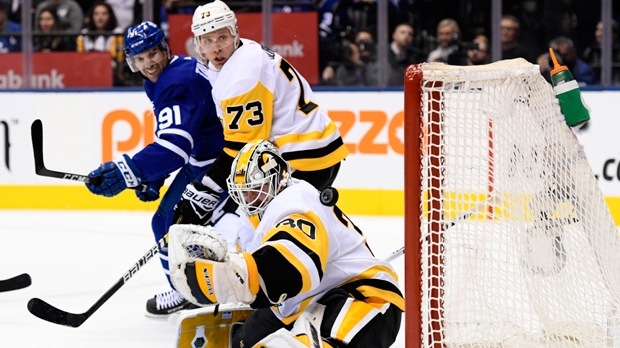 TORONTO -- Zach Hyman scored the winner and Garret Sparks made 28 saves as the Toronto Maple Leafs battled back from an early 2-0 deficit to defeat the Pittsburgh Penguins 3-2 on Saturday. Travis Dermott, with a goal and an assist, and Auston Matthews also scored for Toronto (31-17-3). Jake Gardiner added two assists. Sidney Crosby and Teddy Blueger replied for Pittsburgh (28-18-6), which was without Evgeni Malkin for a second straight night because of an upper-body injury. Matt Murray stopped 30 shots. Both the Leafs and Penguins were playing their second game in as many nights - Toronto lost 3-2 in overtime on the road Friday against the Detroit Red Wings, while Pittsburgh topped the Ottawa Senators 5-3 at home. Toronto, which entered 4-7-1 over its last 12 games, went ahead with 3:54 left in the second period on a slick play by Morgan Rielly and Mitch Marner. The two Leafs worked a give-and-go in tight quarters along the boards before Rielly fired a shot that rebounded to Hyman, who outmuscled Kris Letang and had the presence of mind to kick the puck up to his stick as he fell to the ice and bury his ninth goal of the season. Rielly's assist was his 52nd point of the season, tying the career-high he set in 2017-18. Winners of two straight after losing four of their previous five, the Penguins nearly got that one right back, but Sparks stopped a Patric Hornqvist deflection and Tanner Pearson with his glove on the rebound to send Toronto into the intermission up 3-2. Patrick Marleau had two chances to give Toronto a two-goal lead in the third, but Murray was there both times, including with the pad on a great solo rush by the veteran winger. Pittsburgh pulled its goalie with 1:30 remaining in regulation and had offensive zone faceoff with 28.4 seconds left when Leafs defenceman Nikita Zaitsev just missed the empty net on a shot that went for icing, but the home side managed to hang on. Down 2-1 after the first, Toronto tied it at 9:36 of the second when Marleau won a faceoff after an icing to Gardiner, who in turn fed Dermott for a one-timer that found its way through traffic for his fourth. Sparks, who got the start in place of No. 1 goalie Frederik Andersen in the second game of a back-to-back, made a couple of nice stops earlier in the period to keep his team within one. The first came on a Nick Bjugstad effort off the rush that was followed by a save on Crosby's one-handed opportunity to set the stage for Hyman. Coming off a nine-day break that stretched across the NHL's all-star weekend and their bye week, the Leafs were slow out of the gate Friday in Detroit, and it was more of the same as the Penguins grabbed an early 2-0 lead. Crosby blasted a one-timer past Sparks shortside on the power play at 10:01 of the first for his 23rd. Blueger, who scored his first NHL goal in his second career game Friday, then fired another shot beyond the glove of Sparks with 6:40 left in the period. Pittsburgh nearly made it 3-0 moments later, but Sparks stopped Letang in the slot before Nazem Kadri desperately cleared a loose puck from the crease with his skate. Toronto got on the board at 17:25 when Matthews deftly tucked his 23rd shortside after Murray couldn't handle Dermott's fluttering one-timer. Jake Muzzin made his home debut for the Leafs after Monday's trade with the Los Angeles Kings for two prospects and a 2019 first-round draft pick. The big defenceman got a nice round of applause during player introductions and had the crowd at Scotiabank Arena buzzing six minutes in when he laid out Penguins winger Jake Guentzel with a big hit along the boards. Notes: Former Leafs defenceman Ian Turnbull was honoured with Toronto's J.P. Bickell Memorial Cup by the team's board of directors. The nod came exactly 42 years to the day since Turnbull scored five goals in a game on Feb. 2, 1977 - an NHL record for a blue-liner that still stands. ... Toronto hosts the Anaheim Ducks on Monday. ... Pittsburgh is home to the Carolina Hurricanes on Tuesday.